Peru: "We will reduce mango exports by 20%"
"Last year, Peru's production was spectacularly high and the country exported the largest volume of mango in its history. Unfortunately, the result was that the market was flooded and prices collapsed. We perceived the lowest market prices in our history, and it was difficult to explain to producers the magnitude of market saturation. These large volumes increased even more due to the absence of rain in Piura and Lambayeque. Thus, there was an offer until March, which coincided with the Casma mangoes," stated Melisa Caballero, from Dominus, Peru. Peru's mango production is expected to decrease by around 20%, she added. "This decrease in production is mainly due to an irregular winter with temperatures that were lower than normal in the producing regions. Having 20% less fruit than last year does not mean that there will be shortages, production will be normal. The high volumes gave us an opportunity because we were able to sell all the fruit, even if it was at low prices. More people consumed our mango and, therefore, the market is growing and that is good news." 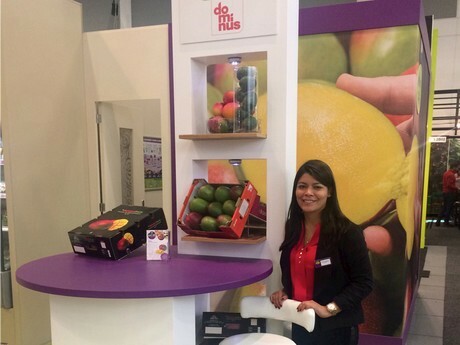 The Dominus company will reduce mango exports by 20% this year, in accordance with the expected reduction in the total Peruvian volume. Melisa says that the main reason is because of how complicated the previous campaign was in terms of prices. "We prefer to focus on the product's quality and the service we provide by supplying of our clients' programs. Today Dominus' main commitment is to bring the best fruit to the market and, in this way, make a difference in value for our producers and for ourselves." The Dominus company is more than just a traditional exporter of fresh mangoes and avocados, according to Melisa. Twelve years ago, it sealed an alliance with Nature's Pride (The Netherlands) to supply them with fresh mangoes. "From the beginning, we have been guided by the demand of a very specialized market. We think that's the reason we approach the business in a slightly different way than other exporters. We considered ourselves a logistics company that aims at taking the fruit from the field to the distributor's warehouse." This vision helped Dominus specialize in the harvest, transport, packaging, and delivery of the fruit to the European customer. "Then we realized that we had to review the process because there were many technical parameters in the sector that had not been taken into account. The result was that we acquired our own packing plant and work with an excellent group of producers. In addition, we changed the way we had been negotiating the fruit with the producers, because it seemed to us that the way we did business did not let the producers know about the international market." "Each market is different, depending on the country, the economy, the season, and so on. We open up and share our prices with producers. We work with them in an open and transparent way. For us it was a risk, but we believe that this model has stimulated the market, making it more attractive and dynamic for producers." Melisa said that changing the business model was not enough. In 2015, Dominus invested in a small frozen fruit factory and a mango farm. "The frozen division of Dominus (IQF) helped us and producers to release all the fruit produced." The 120-hectare mango farm, a traditional plantation, had a low planting density and poor water management. "We worked hard in those two aspects. Today, our mango farm, called Noemi, is a modern plantation with medium density and efficient water use. In five years, since its acquisition, we will have increased its production from 7 tons per hectare to 40 tons per hectare." All those efforts and investments have a reason to be, said Melisa. "We have to show that the mango business must be profitable for all parties involved. However, we believe that most of the benefits should go to producers, who make this possible, and consumers, who pay for fruit in supermarkets. Producers, exporters, international distributors and retailers must reconsider a fair business model in which to work together, a sustainable model. " Everyone in Dominus follows the same philosophy, which can be summarized in one sentence: "The fruit rules". Melisa said that her work was more than providing consumers with a fruit, that they provided them with a complete experience. "We have to manage our processes, our negotiations, and our economy taking into account the two parties. One is the consumer and his experience, and he is paying for it, and the other party is the producer." In other words, "the fruit rules" means that Dominus has to bring all fruits delicately to the market, taking into account the principles of fair trade, social responsibility, good agricultural practices, efficient water consumption and food safety. "We, as exporters of fresh and frozen fruits, bring food to the market, and we take this responsibility very seriously," concluded Melisa Caballero, who has held the position of deputy general director since November. "Being part of Dominus for about 7 years allowed me to learn everything about the sector. The organizational structure of Dominus gives everyone the opportunity to learn about each of the company's processes."